Fifth Harmony, Nick Jonas and more confirmed for Britain’s Got Talent 2016 live shows! Fifth Harmony, Nick Jonas and more guests have been confirmed to perform on the Britain's Got Talent 2016 live shows. 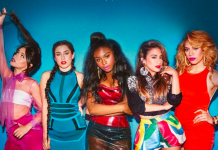 Fifth Harmony announce UK dates on European Reflection tour! The US’s most successful girl group Fifth Harmony returns to the UK as part of their first ever European tour, it is announced today.